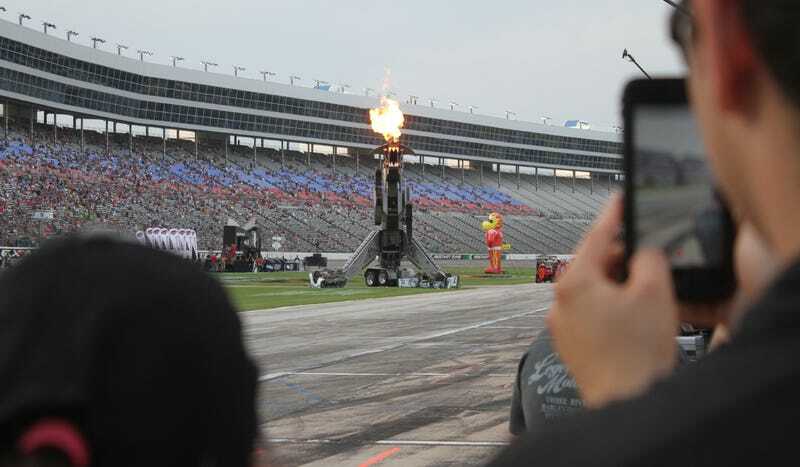 If you were waiting for tonight’s IndyCar race to start at Texas Motor Speedway, neat! Us too! The race is expected to start after 10:00 p.m. Eastern now, as they’re drying the track from an earlier storm. I’m here at the Firestone 600, and I’m going to wander around a bit in the pits until the race starts. Tonight’s race has 22 cars on the 1.455-mile oval at Texas Motor Speedway, hence the rain delay. IndyCar doesn’t have rain tires for its oval races. After it gets started, 248 laps will take the cars 360.84 miles through to the end. It has to get started first, though. We’ve been through Robosaurus and the driver introductions. Now we wait. Humidity is an issue today, as the water just doesn’t go anywhere despite being blown on by jet dryers. Join us as Hooniverse’s Patrick Hoffstetter and I poke through some of the more interesting things we can find behind the scenes. Anything in particular you’d like us to find at the track? Hit us up on the Facebook thread here.